As part of the Read Tuesday celebration (a Black Friday type of event just for book lovers on December 9, 2014), I have several amazing deals, but none as incredible as my self-publishing boxed set prices. I have incredible deals for the Kindle edition and paperback edition (and yet another if you want both). These are 4 full-length books (plus bonus material). You get 628 pages. The paperback is 8.5″ x 11″ in size and weighs 4 pounds. If you want both editions, you may prefer the MatchBook offer (buy the print edition and get the Kindle edition for free). If you prefer the print edition, you have two options. You could buy the print edition for $19.99 at Amazon (it could be discounted, too; last I checked, Amazon had it marked down another 10%). That’s a great value: If you buy them separately, it costs you $37. It’s so cheap, I can’t even enable the Expanded Distribution channel at this price. You save 46%. But there is yet a better option. Visit my CreateSpace eStore at https://www.createspace.com/5099591 and use the discount code LARLUWFM to save 40% off the list price. This brings the price down to $11.99, which saves you 68% off the price of buying all 4 books individually. These deals won’t last. 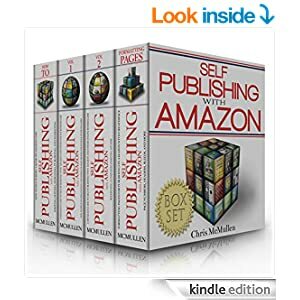 You can’t expect the Kindle boxed set price to stay below the price of Volume 1 for long. That really is crazy! Remember, you can also buy the print edition at Amazon and get the Kindle edition for FREE. For this, you must buy the print edition at Amazon (not CreateSpace), and you must buy the print edition before purchasing the Kindle edition (and you must buy both editions from the same Amazon account). This is just one of many amazing Read Tuesday deals. It’s like a Black Friday for book lovers, on December 9, 2014 (but many of the books have started their sales early). For example, Heroes to Swoon For Boxed Set: 11 Sizzling Contemporary Romances is even better than my boxed set deal. Get 9 full-length romance novels for 99 cents. Regularly $9.99, you save 90%. It’s no wonder this pre-order is ranked in the top 1000 overall in the Paid Kindle Store. Buy the print book at Amazon, get the Kindle edition free: http://readtuesday.com/matchbook. Paperback in the UK: http://www.amazon.co.uk/dp/150318420X. I think I’m going to get this set just for the section on formatting. Do you format our own books or do you pay someone to do it? I was hoping to see an example.